Thanks to One2One Network (#O2O) I've been able to listen to the new #WeLoveDisney CD the last few days. The album features the hottest artists from across the pop, rock, R&B, and country worlds delivering their own unique interpretations of classic Disney songs. These were all (mostly) songs I was familiar with, and I really liked hearing them re-imagined. 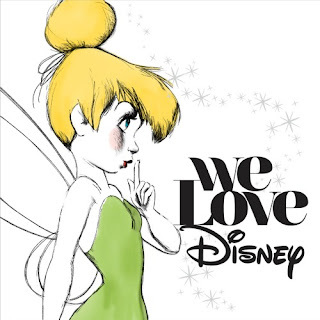 I was not familiar with most of the artists featured on this album, but after listening to We Love Disney, I am ready to check some of them out and see what the rest of their music sounds like. I am really enjoying the vocals on this. The album starts off with the suave, big band feel of Friend Like Me, which I absolutely loved. Check out the video on YouTube; I think you'll like it too. I looked up several of the original songs from the Disney movies on YouTube, just to compare them to the ones on this album - Friend Like Me, I Wanna Be Like You, and Everybody Wants to Be a Cat, to name a few. I feel like all the songs stay true to the originals while being something entirely updated and new at the same time. I'm liking the Rascal Flatts and Lucy Hale version of Let It Go better than the original. Also, even though I usually consider It's a Small World one of the most annoying songs on the planet, probably because of having to ride the ride over and over and over with my children, I almost like it on this album. They did a very nice job. We Love Disney will be available October 30th and can be pre-ordered now on iTunes and Amazon. For more information, visit the Official We Love Disney website.